Used vintage Napoleon body and arms, and used vintage Genghis head, hands, and legs, and used apoxie sculpt to customize the base figure. 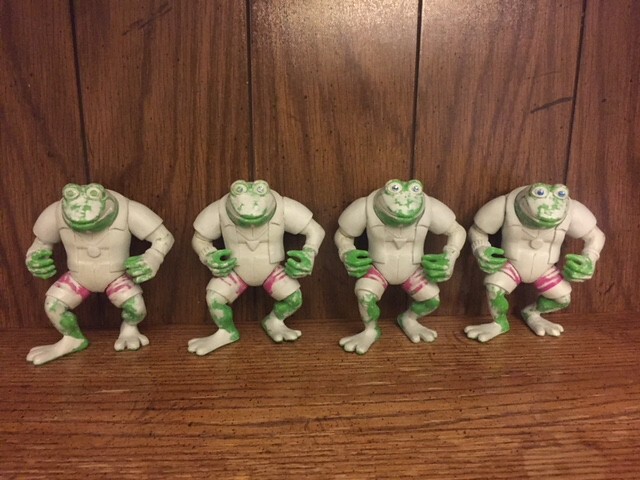 Made all 4 punk frogs toon accurate Genghis Frog, Napoleon Bonafrog, Atila the Frog, Rasputin the Mad Frog. Painted everything wiith acrylic and enamel paints. Customized some accessories as well. Last edited by TurtleManiac; 06-06-2018 at 09:22 PM. I love them. 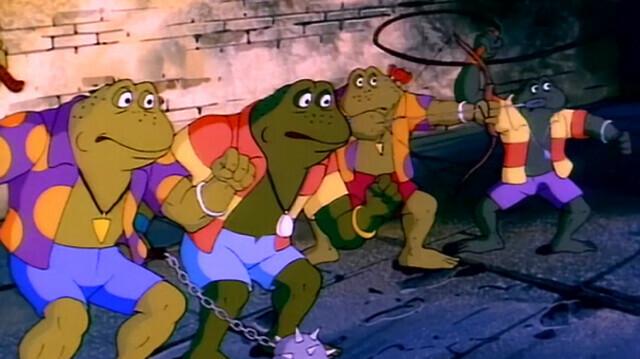 The Punk Frogs are my favorite allies of the Ninja Turtles. 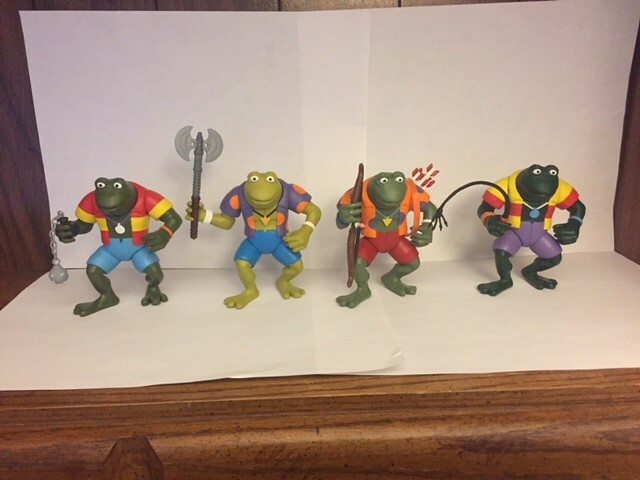 I was disappointed in getting just half of them and Napoleon Bonafrog looked nothing like he is supposed to. I would love to see one for sale one day! 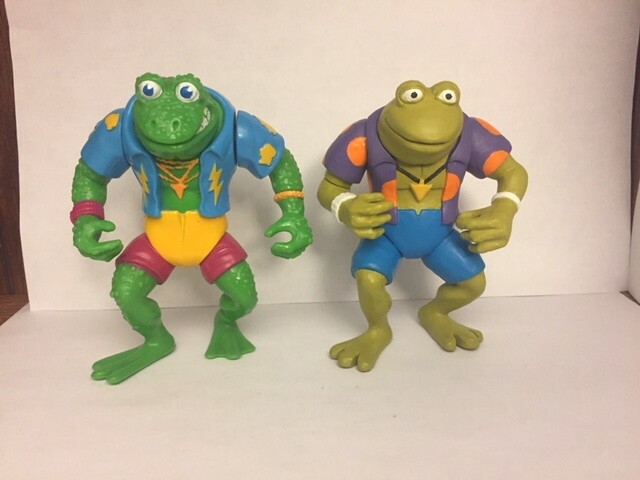 These Punk Frogs look great! That's a very well done job. 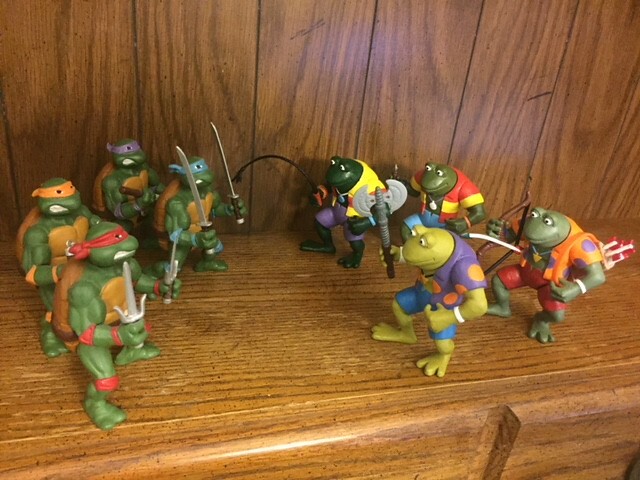 Just wondering TurtleManiac, do you ever offer customs like this for sale or make a specific one for someone by request? Yeah man! Perfect! Shocked there isn't more love from the peeps here. You did such a great job! They look very much like their cartoony 'selves. Good job indeed. Even if I still can't match their names to their cartoon designs. Thanks! 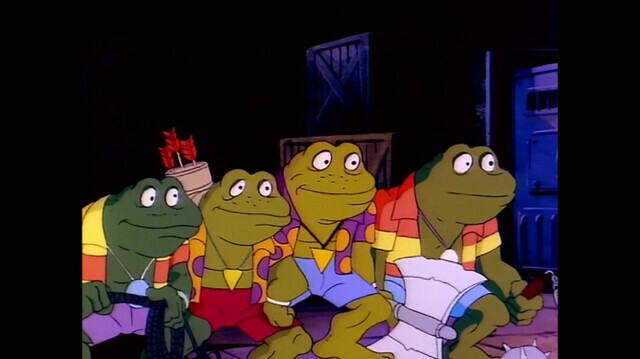 Yeah I suppose from a manafacturer’s perspective, probably made more sense not to make all 4 frogs, and to change Napoleon’s appearance so drastically. Thanks! No I haven’t done any commisions, just making these for myself is already so time consuming. I have sold a few customs from time to time, just to free up some space for new ones. Thanks for the kind words! Much appreciated! Hey thanks! I tried to make them as cartoon accurate as I could. Thanks! Making these actually helped me telling each frog apart easier, since I really had to study their appearance. 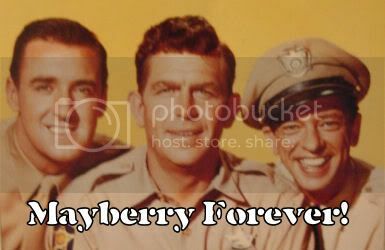 I will go back and put their names next to each off their individual pics. After seeing these in pics I notice a few things here and there that could be improved. I will go back and touch these up in a few weeks when I get back from vacation. Might possibly make more toon accurate axe for Genghis. Yeah I totally understand that. 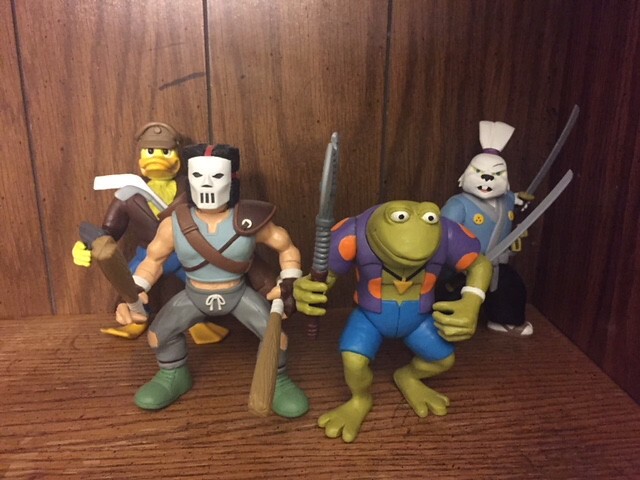 If you ever do get some free time someday and you would want to make an Archie TMNT Adventures inspired figure (maybe as a challenge, something different, etc. ), we could talk about it in a pm. 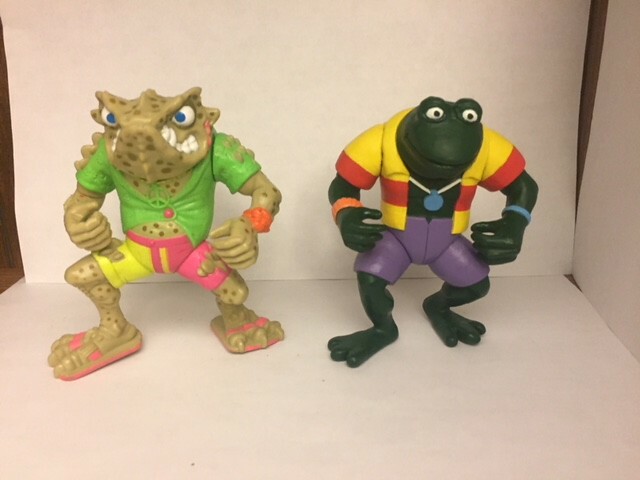 Either way the Punk Frogs are great. Great job on those! Great job on these, TM! The MOTU axe for Genghis made me smile. I thought that was Panda Khan's axe. 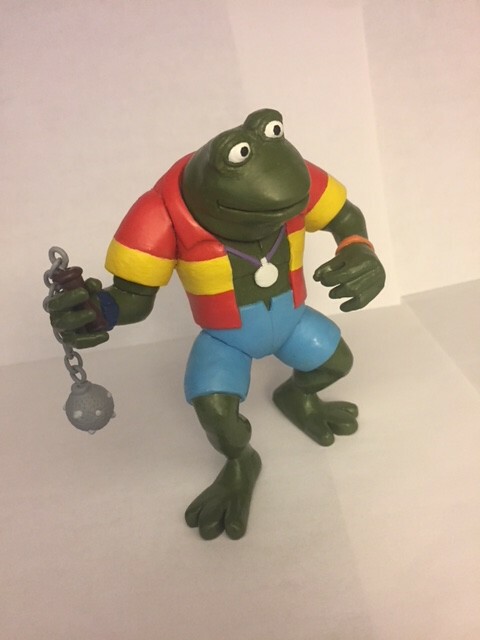 As a kid the Punk Frog episode was always my favourite, and I never understood why they released such a weird looking Napoloen Bonafrog figure, although I always liked the figure it just never looked as toon accurate as Ghengis did. 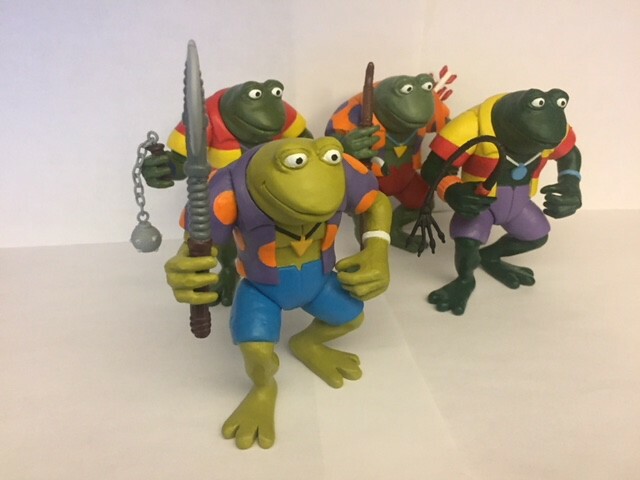 I'm not sure when the first Napoleon figure came out, but maybe it was partially inspired by his monstrous transformation seen in the episode "Napoleon Bonafrog, Colossus of the Swamps." 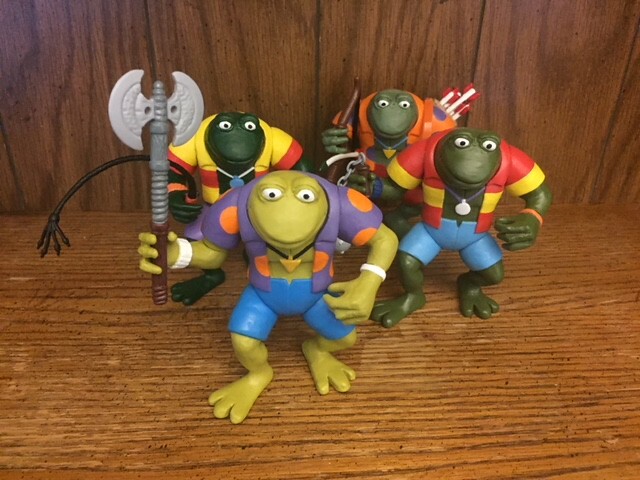 Anyway, if they had release a toy accurate figure, it probably would have just been a Genghis Frog reissue with altered paint or accessories. Genghis was a part of the 1989 extension of the 1988 original set. 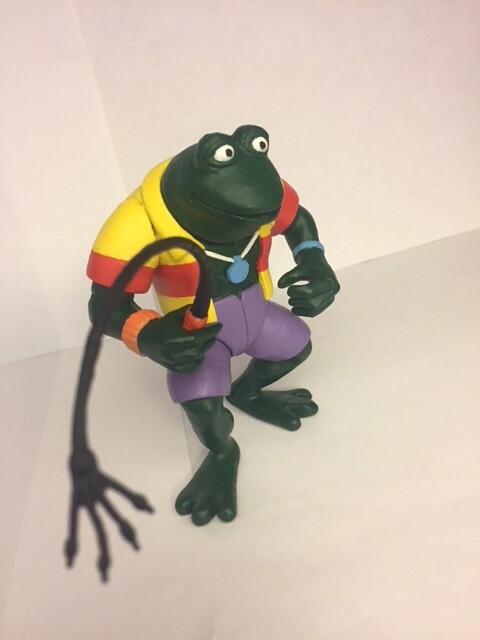 Napoleon Bonafrog was a part of the 1990 line a year later. A year after that Napoleon: Colossus of The Swamp aired as a part of the fifth season. So its possible that the odd choice in design inspired the episode. Ah, OK. I've never heard of, or seen that episode. I'll have to catch up with it. Those are super cool. Super accurate, too... kinda surprising Playmates didn't go this route, and make all four! 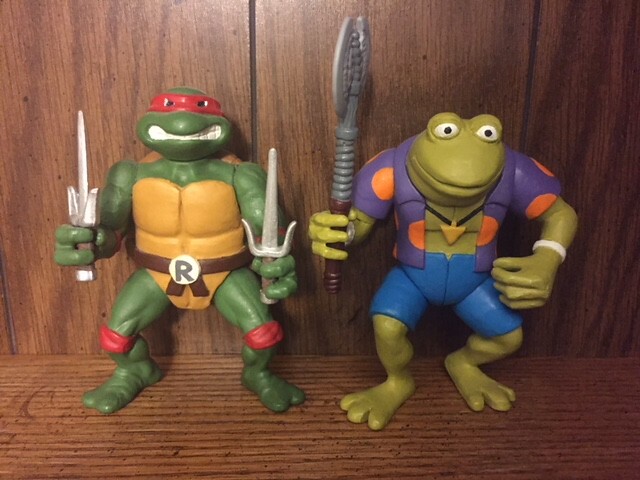 But I guess you gotta have Pizza Chef Michelangelo and Urban Outfitter Donatello, huh? Thank you all for the kind words, very much appreciated!!! 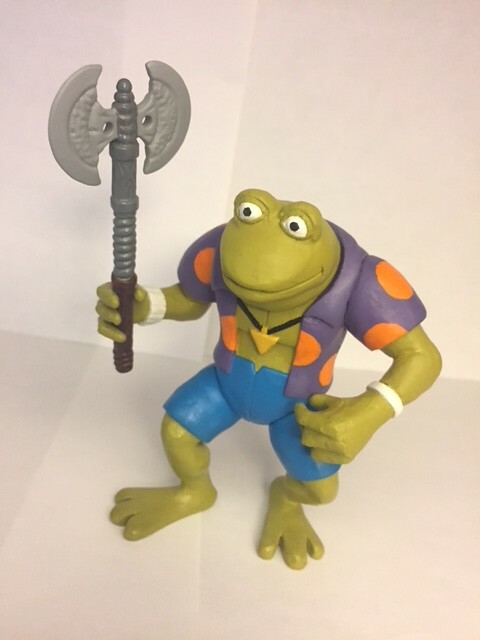 The axe is the same axe mold that originally came with Panda Khan, but this one was purple so must have been some variant. The whip and ball&chain I believe both came with Sword Slicin' Leo, I added an actual chain to the ball&chain. 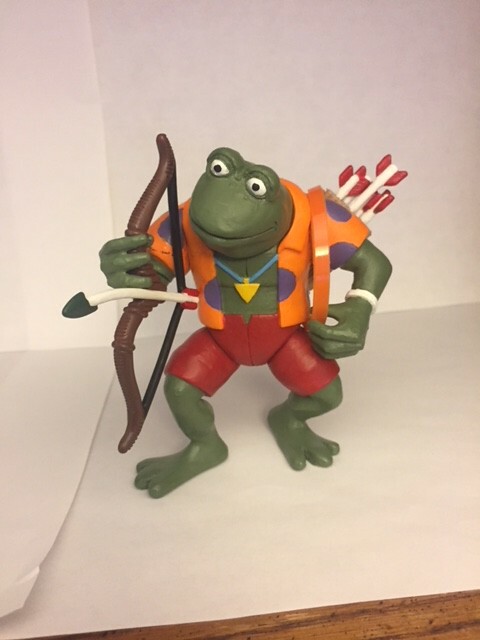 The Bow&Arrow was the orange accessories that came with Movie Star Splinter, I left the strap unpainted to blend in with the orange shirt, since on the cartoon there is no strap, it's just floating on Rasputin's back. Might change it later and might change the axe later for Genghis. Added a WIP pic. 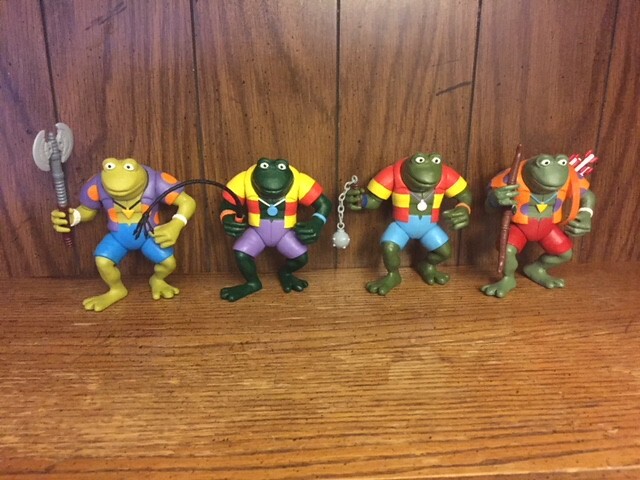 The reason I used Napoleon's body instead of just using a full Genghis figure as the base, is I wanted the frogs to stand shorter than the original Genghis figure, so that they're more closer in height to the turtles. 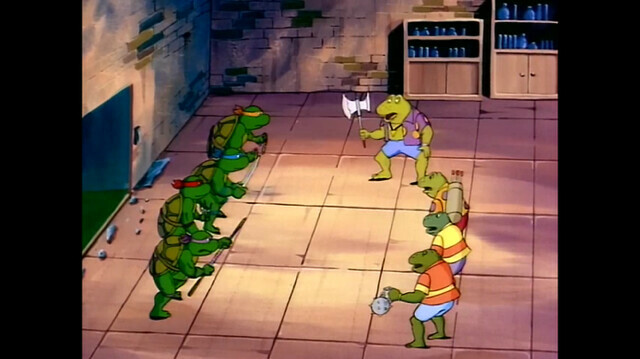 The original Genghis Frog figure stands taller than the turtles, but on the cartoon the frogs appear to be smaller. Class of 1989, waiting on Metalhead (future custom). Last edited by TurtleManiac; 07-08-2018 at 12:50 AM.